Amy Allen, businesswoman and first time author and mother created the perfect bedside-table book. 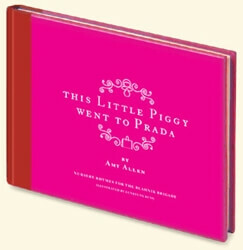 This Little Piggy went to Prada is bound in contrasting hot pink and rich red linnen. In it, Amy Allen rewrites nursery rhymes with a stylish twist. The original rhymes are toward the back of the book. This fashionable illustrated nursery rhyme book is the ultimate babyshower gift for those jet-setting, fashionistas in your life !